This set of wrist radiographs is obtained to evaluate patients with post-traumatic radial-side wrist pain with suspected scaphoid fracture or scapholunate ligament tear. Often these patients are adolescent males who have fallen onto outstretched upper extremity during a sports injury. The wrist is usually dorsiflexed (extended) at the moment of impact. Typically, the patient is tender with palpation of the scaphoid. The lateral wrist view has already been described in the section on wrist imaging. The three other views are detailed below. Position – Patient is sitting with shoulder abducted about 90-degrees, elbow flexed 90-degrees, forearm pronated and fist clenched. Forearm and wrist rest on the x-ray cassette with palm down. X-Ray Beam – Centered on the carpus and directed perpendicular to the cassette (or with slight 10-degree cephalad tilt). Demonstrates – Scapholunate diastasis if scapholunate ligament tear is present. Position – Patient is sitting with shoulder abducted about 90-degrees, elbow flexed 90-degrees, forearm pronated, fist clenched and wrist ulnarly deviated. Forearm and wrist rest on cassette with palm down. X-Ray Beam – Centered on the carpus and directed posterior to anterior, perpendicular to the cassette. Demonstrates – Scaphoid is seen in profile. 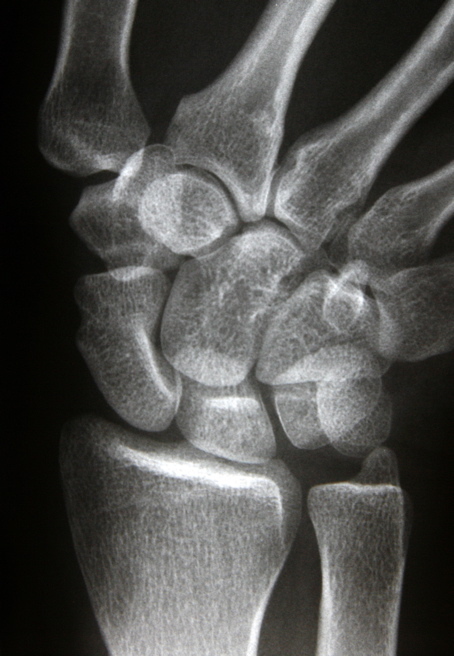 Subtle scaphoid fractures may be shown. 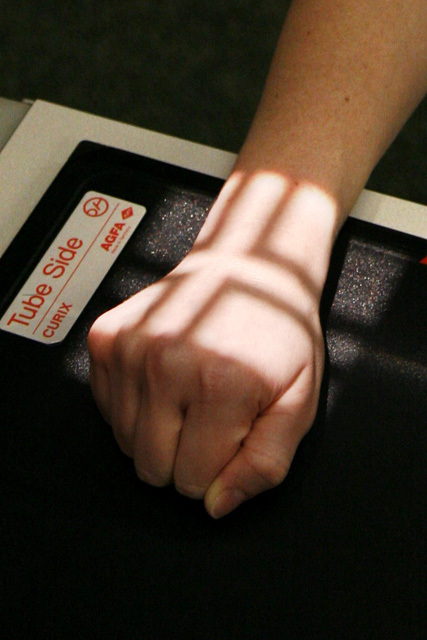 Position – Patient positioned as for preceding view but with wrist resting on magnification tube. 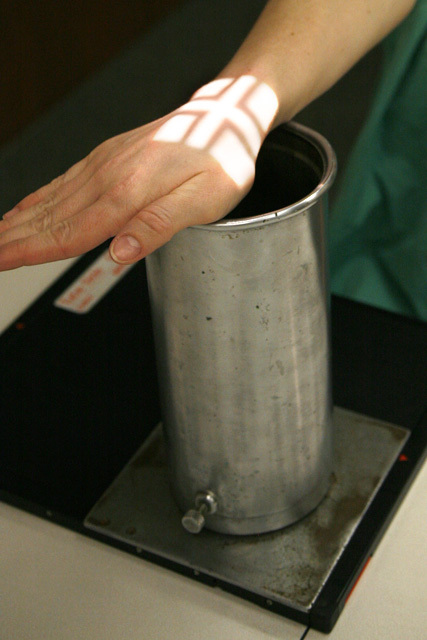 X-Ray Beam – Centered on the scaphoid and directed posterior to anterior, perpendicular to the x-ray cassette. 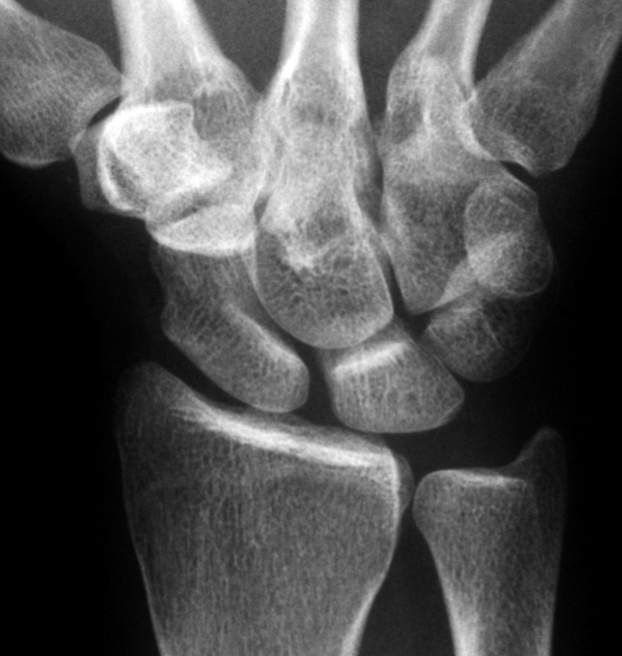 Demonstrates – Enlarged view of scaphoid. Subtle scaphoid fractures may be seen. Advanced imaging of the wrist may be helpful in certain clinical situations. When scaphoid series is negative for fracture, but scaphoid tenderness on physical examination persists, a technetium bone scan is indicated. If increased uptake of radiotracer is found in the scaphoid, then occult scaphoid fracture is confirmed. 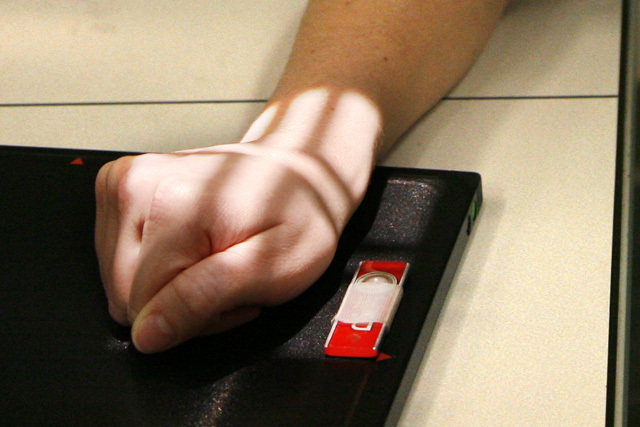 In this circumstance, the patient’s wrist should be immobilized until the scaphoid fracture is clinically healed. Wrist arthrogram is useful to confirm diagnosis of suspected scapholunate ligament tear or triangular fibrocartilage complex (TFC) tear. Injection of radio-opaque dye into the radiocarpal, mid-carpal and distal radioulnar joints (triple injection technique) may be necessary since some ligamentous tears allow dye to flow in only one direction. 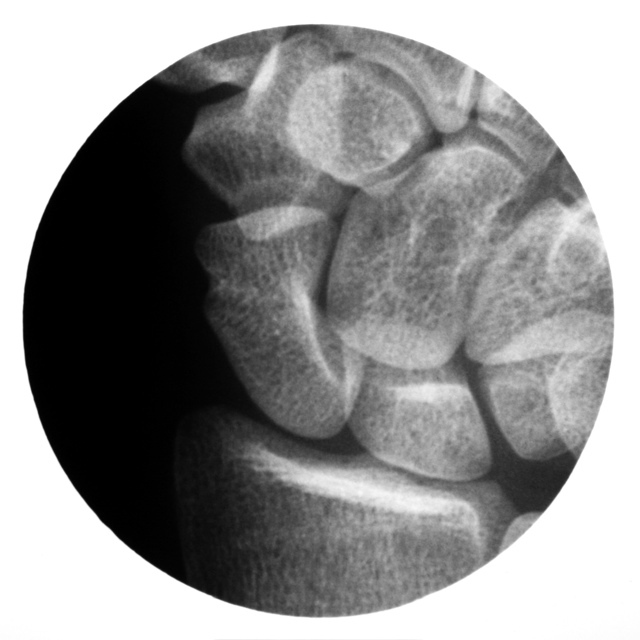 The arthrogram may be combined with thin-section, high-resolution MRI evaluation of the wrist to confirm a small tear in these soft tissue structures. Wrist arthroscopy for symptomatic patients with confirmed scapholunate ligament or TFC tears is the treatment of choice. CT scan of the wrist may be indicated in patients with distal radioulnar joint (DRUJ) subluxation or dislocation. This specialized imaging technique is used to evaluate DRUJ congruity in patients with DRUJ instability. In our opinion, these advanced imaging studies should be obtained as preoperative planning aids by the orthopaedic consultant.